The term “right-sizing” refers to converting a business unit to the optimal size to achieve maximum profit or efficiency. 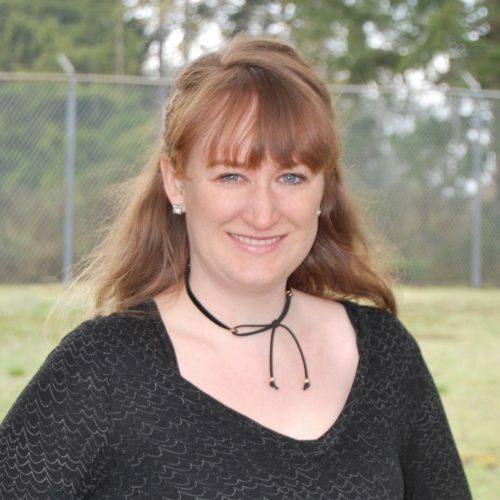 In this case, it describes the trend of businesses shifting their fleets from trucks to vans. Commercial van sales have been on the rise for the last few years, as fleet managers revise their vehicle needs, and opt for vans over trucks. For many industries, vans provide the right amount of cargo space without the added bulk and price associated with larger work trucks. Vans offer a variety of attractive benefits, including a reduced environmental footprint, lower fuel consumption, better cargo organization, theft and weather protection, and easy driving and maneuvering. In some cases, vans even offer more payload than some light-duty pick-up trucks. Delivery services and mobile work sites are two industries readily adopting van fleets, with the latter often requiring special equipment on the vehicles. These special equipment requirements present an opportunity for manufacturers to offer van-specific solutions. For example, many mobile work sites use air tools to perform jobs such as tire servicing, utility servicing, and forklift repair. VMAC’s UNDERHOOD40 Van Series Air Compressor has been developed specifically for service vans performing these applications. In addition, it addresses unique safety concerns associated with vans and traditional standalone air compressor systems. There are several options available when considering an air compressor for your van, but many options are truck solutions modified to fit inside vans. Installing a traditional air compressor inside of a van can cause many issues, as these compressors can be bulky and heavy, reducing available cargo space and payload capacity. Even more importantly, these air compressors compromise operator safety, and can be dangerous if important precautions are overlooked. The VMAC UNDERHOOD40 Van Series Air Compressor eliminates each of these issues, all while being the only air compressor specifically engineered for commercial vans, including popular models by Ford, GMC, Mercedes-Benz, and RAM. The VMAC UNDERHOOD40 Van Series rotary screw air compressor delivers 40 CFM at 100% duty cycle, allowing operators and businesses to maximize productivity without sacrificing space and safety. Like all VMAC air compressors, the VMAC UNDERHOOD40 Van Series Air Compressor is lightweight and compact. The VMAC UNDERHOOD40 Air Compressor mounts in the engine compartment of the van, freeing up space in the cargo area. The VMAC UNDERHOOD40 Air Compressor weighs 290 lbs less than other comparable air compressors. This lightweight air compressor can help improve your fuel economy, or allow you to transport more. 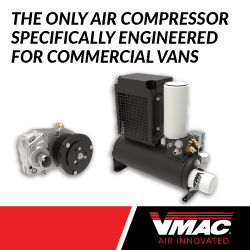 Being specifically engineered for commercial vans, the VMAC UNDERHOOD40 Van Series Air Compressor eliminates safety hazards associated with traditional air compressors being mounted in the van’s cargo area. Being stored safely under the van’s hood ends lifting injuries, toxic fume exposure, and even the risk of gas fires. Learn more about the VMAC UNDERHOOD40 Van Series Air Compressor or watch a video of the air compressor in action.